Seatrade International was founded in 1981 by Stephen Barndollar as an export marketing and trading company. In 1988, Seatrade moved into primary fish processing and opened its first production facility in Portland, Maine. Following a relocation to Portsmouth, New Hampshire in the early Nineties, further plants were opened in New Bedford, Massachusetts, and the company now has a work force of 150 people. Seatrade's goal with their 2007 web site redesign was to update the company's long-standing web presence with a sleek new design and substantially more information about their company, products and the way they do business. The company's primary concerns were that the site remain very easy to navigate and that information regarding any given topic be only a couple clicks away, but it was also rather important that products be well represented. CrystalVision contracted a professional photographer to take a series of new product images at Seatrade's headquarters, blending the results with a contrast-heavy, eye-catching new look. 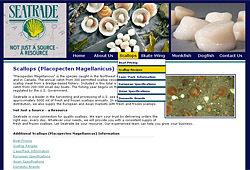 Seatrade's 2007 home page put the focus on both their logo as well as their products which are featured in large, professionally photographed images. The layout is bold and striking, the dark navy blue background contrasting the yellow highlights of the various "photo links." On mouseover, the yellow colored links turn dark green making for an obvious user response. This simple design was enthusiastically embraced by Seatrade's ownership as users could easily decide where they wanted to go by clicking on one of the large "photo links." Inside pages on the Seatrade site feature three large header images, the third acting as an indicator for what section of the site the user is visiting (in the photo, it's the Scallop section). Drop down navigation was utilized to organize the rather vast number of subpages on the web site, but CrystalVision also designed a "page nav" that lists any subpages "under" whatever page a viewer is on. This was in an effort to always have pertinent information nearby without fitting too much on an single page, thus reducing scrolling. 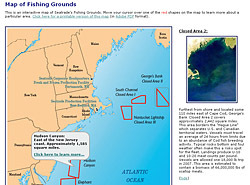 Part of providing more information for their web site visitors was Seatrade's "Map of Fishing Grounds," an interactive graphic featuring hot spots that, when moused-over, display dialogue "balloons" with information about that particular fishing area. If web site visitors want to learn more about an area, they can click on the "balloon" and a write-up about the area will appear to the right of the map. Having current, frequently updated data on a web site often ensures a high visitor return rate. 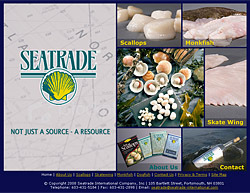 Seatrade International's web site is updated every Monday morning with that week's scallop prices. The information is entered into a simple form located in a password protected administration area. Once entered, the data is charted using a combination of Cold Fusion and Adobe Flash. The chart displays prices for 10-20 piece packages of scallops and 20-30 piece packages. 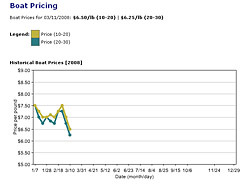 The web site also archives the history of scallop prices dating back five years. Seatrade's relationship with CrystalVision is long-standing, dating back to 2001. Over the years, Seatrade has grown into a top competitor in the scallop industry while diversifying into other seafood products such as skate wing, dogfish and monkfish. The 2007 web site redesign offered the company a chance to further impress current and potential clients by offering an information-rich and easy-to-navigate web experience. The web site represents Seatrade as being aware of current technological trends and greatly out paces the vast majority of their competition both in design and content.